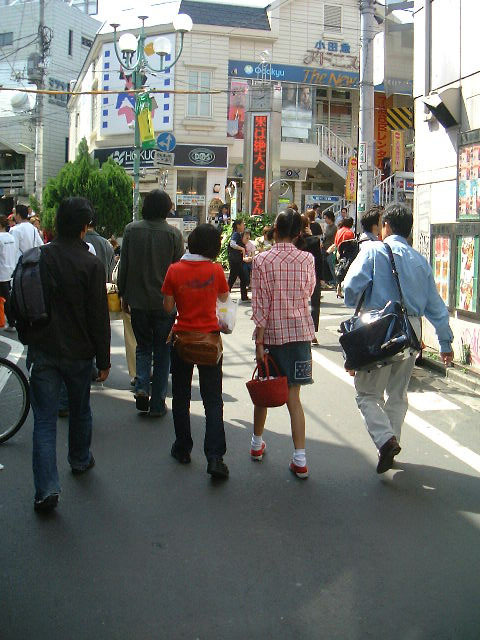 Tokyo Youth Culture Split by Progress? When I lived in Tokyo I went to this place a few times. I liked it a lot, it seemed to be like a bohemian village in this giant sea of conformity. I understand the economic incentives and the complaints of the baba and oyagi, however it seems that they could find a better way to do things. I think this is cultural though. I am 100% sure that most older Japanese see little value in this area. I can easily see them thinking this is just a place for strange young people to act badly (similar to how any young urban enclave is viewed by an older more consevative generation)…but especially so in Japan due to its confucianist ideas of the beauty of conformity. This is sad, although Chen Sui Bien (A-Bien) has not seemed to have accomplished a lot domestically, I liked the way he stood up to China. He is likely guilty of personal crimes as well as being associated with criminals, however I think…no, I know China has agents all over making things 10X worse. China has been trying to use “soft power” to influence the Taiwanese electoric to get him out of power for some time. TAIPEI, Taiwan <http://topics.nytimes.com/top/news/international/countriesandterritories/taiwan/index.html?inline=nyt-geo&gt;, Sept. 27 — Only a longtime democracy and independence activist like Shih Ming-teh, whose credentials include having his teeth shattered twice by guards during a quarter century in prison under martial law, would dare revive the color red in Taiwanese politics. For the past 19 days, Mr. Shih has led a sit-in in front of the presidential palace here by red-clad demonstrators. 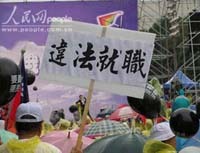 They demand the resignation of President Chen Shui-bian <http://topics.nytimes.com/top/reference/timestopics/people/c/_chen_shuibian/index.html?inline=nyt-per&gt;, the man who now runs the democracy and the political party that Mr. Shih helped to create. Mr. Shih’s campaign, which has drawn up to several hundred thousand people during one evening’s rally but a dwindling crowd in the past few days, emboldened the opposition to start a long-shot legislative effort on Tuesday to recall the president. But Mr. Shih, a man sometimes described as the Nelson Mandela <http://topics.nytimes.com/top/reference/timestopics/people/m/nelson_mandela/index.html?inline=nyt-per&gt; of Taiwan, is now leading a movement that, as he acknowledged in an interview, is heavily composed of Nationalists, his longtime enemies who once ran the country under martial law. Leaders of President Chen’s Democratic Progressive Party, which Mr. Shih ran in the 1990’s as chairman, are bitter to see him now aligned with many Nationalists. “I hope he doesn’t forget those are the guys who tried to kill him, and now they support him as if he is a god,” said Mark Chen, the secretary general of the presidential office. Mr. Shih’s choice of red for what he describes as an anticorruption, “people power” movement is especially surprising. The color is associated here with the Chinese Communist Party on the mainland and with Mao’s Cultural Revolution, a period of political persecution that lasted from 1966 to 1976. Red was taboo in Taiwanese politics for decades after Chiang Kai-shek and the Nationalists fled here in 1949, following their loss in China <http://topics.nytimes.com/top/news/international/countriesandterritories/china/index.html?inline=nyt-geo&gt;’s civil war to the Communists. Under martial law, the secret police engaged in a series of witch hunts for Communists, killing and imprisoning thousands; Mr. Shih and others like him who advocated democracy and political independence for Taiwan, when the Nationalists still claimed the mainland, were accused of treason. Mr. Shih said there should be nothing the matter with red now. “I am a very confident man, and red has been politically labeled for too long in Taiwan — the people have the right to choose any color,” he said with a mischievous, closed-lipped smile. Mr. Shih accuses the president and his family of corruption, but he is not the only one making that accusation. This summer, civil-service prosecutors charged the president’s son-in-law, Chao Chien-ming, with insider trading and sought an eight-year prison term for him. Mr. Chao denied any wrongdoing, and the case is still pending. Prosecutors are also investigating accusations that the president’s wife, Wu Shu-chen, may have obtained large numbers of gift certificates from a department store chain that was seeking government permission for a change of ownership. They have also looked at whether President Chen and his wife adequately accounted for money from a special fund personally controlled by Taiwan’s presidents for decades for use in secret diplomatic initiatives. Mark Chen, the presidential office’s secretary general, who is also a former foreign minister and who is not related to the president, said in an interview at the presidential palace on Tuesday that “our president is clean and the first lady is clean.” He accused the Taiwanese media of inflating allegations of misconduct. He also noted that the president, in an effort to clear his name and his wife’s, recently allowed prosecutors to interview him even though the Constitution grants him immunity from prosecution. The Nationalists have repeatedly tried to push President Chen from office, staging violent protests after the president won re-election in a disputed vote in 2004. Allegations of corruption are especially touchy in Taiwan. The Nationalists ended martial law in 1987 and then lost the presidential election in 2000, to a considerable extent because of popular indignation at widespread corruption. It was nicknamed the “black gold” issue here because many of the bribes and other illegal payments came from organized crime, and funereal-looking black suits are practically a uniform for many gangsters here. By contrast, the Democratic Progressive Party has long presented itself as largely free of corruption. Mr. Shih said that it would be better for the Democratic Progressive Party if President Chen stepped down instead of serving the 20 months remaining in his second term. With the president’s approval ratings below 20 percent in opinion polls, his continued stay in office could help the Nationalists win the Taipei and Kaohsiung mayoral elections this December, legislative elections in December next year and the presidential election in March 2008, Mr. Shih suggested. The party has hit back at Mr. Shih by releasing photographs of his recent meeting in Bangkok with a financier who is on Taiwan’s list of the 10 most-wanted fugitives for deals that have left Taiwanese banks facing large losses. But Mr. Shih said the entire sit-in effort, including a stage, a large-screen television and other supplies, had been paid for with donations of $3 apiece by a million citizens from across Taiwan. Mr. Shih, who will turn 66 in January, is a leader of a generation of tough, street-wise demonstrators who fought Chiang Kai-shek’s police and languished in his jails. But charismatic lawyers like President Chen, 55, a graduate of National Taiwan University’s law school, pushed Mr. Shih’s generation of activists aside at a Democratic Progressive Party leadership conclave in 2000. Mr. Shih practically disappeared from politics afterward, refusing even to accept a senior presidential appointment, and he has managed to return to the center of the political stage with his unusual campaign only in recent weeks. Beijing and American officials have stayed silent about the political dispute here. But President Chen did set off a controversy over the weekend when he said that people in Taiwan should “seriously consider” whether to come up with a new definition of its territory. The Taiwanese Constitution vaguely defines this territory in a way that can be interpreted to include mainland China and even Mongolia. This definition allows China, the United States and other countries to maintain that there is still one China that encompasses Taiwan and the mainland. President Chen has repeatedly promised not to change sovereignty issues in the Constitution, which the mainland has warned could be the basis for war. Weekend and evening rallies at the site of the sit-in since Sept. 9 have drawn crowds that peaked at more than 300,000 people on Sept. 15. But about 200 people were present at Mr. Shih’s sit-in on Wednesday morning, and some in Taiwan are wearying of the standoff. Many are waiting for the results of the initial inquiry into the first lady’s activities, scheduled to be released sometime in October; Mr. Shih said he planned to start holding rallies against the president in other Taiwanese cities soon, and moved his sit-in on Wednesday evening from the presidential palace to the grounds of a nearby railway station. The presidential palace remains ringed with barbed wire as a precaution, and armored vehicles with mounted water cannons are parked inside. Nobody here expects a repeat of either the street protests that have toppled presidents in the Philippines or the military coups that have periodically brought down governments in Thailand, most recently last week. Mr. Shih said he had urged anyone with the rank of a two-star general or above not to come to his demonstrations, even if they might sympathize. Very right wing indeed…China and S.Korea are already privately pissed I’m sure. TOKYO, Sept. 26 — Shinzo Abe, a popular nationalist who has vowed to make Japan more assertive globally, became the country’s prime minister today, and named a Cabinet packed with social and foreign policy conservatives. Mr. Abe, 52, bowed deeply in front of fellow lawmakers after winning 339 votes in the 476-member lower house, which selects the prime minister. Earlier in the day, Mr. Abe’s predecessor and political mentor, Junichiro Koizumi, vacated the prime minister’s residence in central Tokyo after five and a half years that saw him win public adulation for making painful economic reforms. Mr. Abe was virtually ensured to succeed Mr. Koizumi after winning last week’s leadership election in the Liberal Democratic Party, which has ruled Japan almost continuously for the past half century. As Japan’s youngest prime minister since World War II, and the first to be born after the war, Mr. Abe’s ascension appears to mark a changing of the guard in a country that has kept a low-profile in international affairs since its defeat in 1945. After winning the vote in parliament, Mr. Abe (pronounced AH-bay) immediately began making changes aimed at strengthening the prime minister’s office, which in the past has been a weak center in a nation dominated by powerful bureaucrats and entrenched special interests. “The new era of Abe begins,” proclaimed Hidenao Nakagawa, the Liberal Democratic Party secretary general. One of Mr. Abe’s first steps was to increase the number of advisors to the prime minister, adding new posts for aides in charge of national security, education and the North Korean abduction issue. Members of Mr. Abe’s staff have said these aides will have their own staff of experts and researchers, allowing them to draw up policy directly without relying on ministry bureaucrats. In particular, the security advisor will eventually have a staff of several dozen, with the announced aim of creating a Japanese-version of the U.S. National Security Council. This has led many here to comment that Mr. Abe was trying to make the traditionally weak prime minister’s office look more like a seat of strong executive power. “Mr. Abe is definitely trying to build something that looks like the White House,” said Tomoaki Iwai, a professor of politics at Nihon University. After winning leadership of the ruling party last week, Mr. Abe reportedly spent several days holed up in his country retreat near Mt. Fuji, deciding whom to include in his new Cabinet. Mr. Iwai and others said Mr. Abe’s choices reflected a hawkish bent to the new administration. Most were also in their 50s, a decade younger than many Cabinets in the past. One of the most watched appointments was to the new post of national security advisor. This went to Yuriko Koike, a 54-year-old former television news reporter who has been a vocal supporter of economic sanctions on North Korea since it admitted kidnapping Japanese citizens two decades ago. Another was the selection of Eriko Yamatani to the post of education advisor. A 56-year-old former reporter for the Sankei Shimbun, a right-wing daily, Ms. Yamatani has been a vocal critic of sexual education and teaching of “excessive” gender equality in schools. The incoming state minister in charge of gender equality, Sanae Takaichi, was another social conservative who opposed allowing women to legally keep their maiden name after marriage. The choice of Mr. Shiozaki as chief Cabinet secretary, Japan’s equivalent of the White House chief of staff, was widely viewed as a move to strengthen Mr. Abe’s personal control. Mr. Shiozaki, 55, is a Harvard-trained former central banker and close ally of Mr. Abe who is widely respected among younger Liberal Democratic lawmakers. In contrast, the new Cabinet featured no political heavy-weights in top economic posts, reflecting what some economists and political scientists said was a shift in priorities toward foreign policy and national security. This was a departure from Mr. Koizumi, who had filled economic posts with prominent reformers like Heizo Takenaka, a former economics professor now widely credited with fixing Japan’s long bad loan-ridden banking system. Mr. Takenaka had already said he was retiring from politics when Mr. Koizumi stepped down. The most prominent appointee was Hiroko Ota, an economics professor and confidante of Mr. Takenaka, who became economic policy minister. Economists and political scientists said her role would likely be to keep current reforms in place, but not add new ones. Instead, many here believe one of Mr. Abe’s top priorities will likely be revising the pacifist Constitution, written by Japan’s postwar American occupiers, to permit the country to have full-fledged armed forces. Mr. Abe has also spoken in favor of a new law to allow Japan to send troops overseas on peacekeeping missions, and of closer military cooperation with Washington, Tokyo’s most important ally. At the same time, many here also hope that Mr. Abe can smooth relations with South Korea and China, which soured after Mr. Koizumi paid visits to a controversial Shinto shrine honoring Japan’s war dead. But the new prime minister risks angering Asian neighbors with his calls for Japanese schools to teach more patriotism and traditional values, at a time when many of Japan’s former wartime victims accuse the country of whitewashing military atrocities from its textbooks. The Liberal Democratic Party is also counting on Mr. Abe to help lead it to victory in upper house elections next year, the first since the exit of the charismatic Mr. Koizumi. Besides being popular among younger voters, Mr. Abe also boasts an impeccable nationalist pedigree that appeals to veterans’ groups and others in the ruling party’s right wing. In speeches, he frequently refers to his grandfather, Nobusuke Kishi, a wartime economic ministry official who was jailed briefly by the Americans as a war criminal and later became prime minister. I see this as Hu consolidating his power. The Shanghai Party was the power base of Jiang Zemin…they have long held the reigns of power in China and he is simply reducing their influence. BEIJING, Monday, Sept. 25 — Chinese security officers have detained the powerful party boss of Shanghai for corruption, as President Hu Jintao <http://topics.nytimes.com/top/reference/timestopics/people/h/hu_jintao/index.html?inline=nyt-per&gt; expands a crackdown on graft that has focused on prominent political opponents. Chen Liangyu, the Communist Party’s top official in the wealthy East Coast enclave and a member of the ruling Politburo, was formally detained on Sunday afternoon, Chinese state media confirmed Monday afternoon. It is exceedingly rare in China for members of the ruling Politburo to face legal trouble, even when the authorities have evidence of corrupt activities by them or people close to them. Mr. Hu almost certainly would not have approved of the action unless he considered Mr. Chen an obstacle to his political control or his policy agenda. The action seems intended mainly to reduce local resistance to edicts by Mr. Hu and Prime Minister Wen Jiabao <http://topics.nytimes.com/top/reference/timestopics/people/w/wen_jiabao/index.html?inline=nyt-per&gt;, while also smashing the remnants of the political clique that had been tied more closely to Jiang Zemin <http://topics.nytimes.com/top/reference/timestopics/people/j/_jiang_zemin/index.html?inline=nyt-per&gt;, China’s former paramount leader, than to Mr. Hu. Mr. Hu is seeking to reshuffle the members of the Politburo and all the leading government and provincial posts at the 17th Party Congress to be held next year. He has sought to extinguish opposition to his priorities among senior party members ahead of that event and to anoint his own successor. Mr. Chen’s political machine has long been considered one of the strongest and most corrupt in a country where the powerful find ways to claim a big share of the country prosperity, despite almost constant anti-corruption campaigns within the ruling party. As Shanghai party boss, Mr. Chen enjoyed considerable leeway to run China’s wealthiest urban region. Friends and relatives of Mr. Chen are suspected of using access to public funds,, including Shanghai’s pension fund, to enrich themselves, people informed about the investigation said. They said at least half a dozen other officials and many prominent local deal makers have also been arrested in recent weeks. Mr. Chen, 60, inherited the political base of Mr. Jiang, who rose to prominence as Shanghai party boss in the 1980’s and subsequently promoted many of his cohorts to top national party and government posts. He was once seen as having the potential to join the Politburo Standing Committee and compete for China’s top political titles. The so-called Shanghai faction did not operate like a cohesive political clique in recent years and failed to help Mr. Jiang himself retain his final post as military chief in 2004, when Mr. Hu forced him into retirement and consolidated his own power. But Mr. Chen resisted central government demands to reduce speculative real estate investment and tamp down economic growth to prevent waste and overheating. He offered a prominent symbol of the strength of local party machines even in the face of heavy pressure from the Beijing leadership, so his downfall seems likely to signal Mr. Hu’s rising authority. The last time a sitting Politburo member lost his post for corruption was in 1995, when Mr. Jiang, then China’s top leader, purged Chen Xitong, the Beijing party chief Mr. Jiang considered a formidable rival. Chen Liangyu, who is not related to Chen Xitong, was detained under “double regulations,” a form of house arrest for members of the Communist Party suspected of wrongdoing. Such detentions do not necessary lead to legal charges, but after losing the confidence of the top leadership, Mr. Chen will almost certainly be stripped of his political posts. His detention is a black mark for Shanghai, which China has built into a showcase market economy and financial center in an attempt to present its most sophisticated face to the outside world. The ongoing investigation into corruption provided a glimpse into another side of the city’s stunning growth. Mr. Chen’s political machine controlled a great swathe of Shanghai’s economy, including prime portions of real estate and major infrastructure projects. A huge investigation by the central government into corruption there focused on the misuse of pension funds to invest in building projects tied to local leaders and their business cohorts. But Mr. Chen, his relatives and friends were also implicated in a major real estate scandal in 2003 that resulted in a short prison term for one well connected Shanghai businessman, Zhou Zhengyi, but did not focus on Mr. Chen or officials close to him directly. Issues related to that handling of that investigation were revived during the latest crackdown, people informed about the investigation said. Mr. Hu’s corruption crackdown began last spring and picked up pace during the summer months. It has so far resulted in the arrests of lower-level officials and well-connected businessmen in Shanghai, Beijing, Tianjin, Fujian and other areas. Most of the people implicated in the scandals are viewed as old loyalists of Mr. Jiang or members of the Politburo not considered among the core supporters of Mr. Hu, leading to suspicions that Mr. Hu has used the fight against corruption as a tool to eliminate opponents. Some party officials acknowledge that it is rare for officials in China to climb the political ladder without quietly securing economic benefits for themselves or their friends and relatives. The party-run security apparatus usually does not seek to stop such behavior unless the officials in question falls from political favor, they say. LUSAKA, Zambia — Making a living is never easy in Kamwala, the cramped, grimy but bustling marketplace in downtown Lusaka, where Nally, a middle-aged mother of five, has been selling clothes out of a small wooden stall for the past 15 years. But things took a turn for the worse, she said, when the Chinese moved in down the block a few years ago. Chinese retailers operating in Kamwala have undercut her prices and lured away her customers, Nally said, holding up a pair of women’s underwear that she would normally try to sell for 10,000 kwacha, or about $2.55. In the run-up to presidential elections this Thursday, Nally said she has listened with interest to one candidate in particular: Michael Sata, the man at the heart of an election-year skirmish that has drawn attention to China’s growing economic and political clout in Africa, and the resentment it has caused among some Africans. Mirroring its economic incursions into much of the rest of Africa, China has emerged in recent years as a significant presence in the Zambian economy, particularly in the copper industry — Zambia’s economic lifeblood — but also in other sectors, including textiles, road construction and retail. Sata, a former cabinet minister and the leading challenger to President Levy Mwanawasa, has called the Chinese profiteers, not investors, in a country where unemployment is about 50 percent and more than 73 percent of people live in poverty. Sata has lambasted Chinese-run businesses, accusing them of neglecting the safety of Zambian workers, and threatened to run “bogus” Chinese investors out of the country. He has suggested that, if elected, he would recognize the independence of Taiwan, which China regards as a province that must return to the mainland’s rule. Chinese Ambassador Li Baodong said that China might sever diplomatic ties with Zambia if Sata became president and recognized Taiwan. The ambassador also raised the specter of a halt in Chinese investment. The debate has been full of crude politics and xenophobia, but it has also served as an illustration of China’s economic involvement in Africa giving way to political influence. “China is a big player everywhere. . . . It’s one of the biggest investors in Zambia,” said Neo Simutanyi, a political analyst at the Institute of Social and Economic Research, a public policy organization in Lusaka. While Sata’s overall support remains uncertain going into the final days of the campaign, his anti-China rhetoric has struck a chord with some in this nation of 11.5 million. The issue — and the topic of foreign investors — has dominated newspaper headlines, radio shows and political discussions, drawing cheers from many lower-paid Zambians, including taxi drivers, shop workers and security guards, and sparking debate even among Sata’s more middle-class detractors. “The issue of China and chasing foreigners is actually a vote winner in the urban areas,” Simutanyi said. The China issue, and a discussion about Sata’s political alliance with former president Frederick Chiluba, whom the ruling government has pursued on corruption charges, has overshadowed other campaign issues, including education and the fight against HIV/AIDS. Mwanawasa, elected with only 29 percent of the vote in 2001, is seeking reelection on a record of market-oriented economic policies and anti-corruption efforts that has pleased the foreign investors and donors that Zambia relies upon heavily. Sata, a veteran politician nicknamed “King Cobra,” has a reputation for getting things done. Taxi drivers routinely point out a major bridge on Lusaka’s busy Great East Road as Sata’s handiwork and as an illustration of his ability to cut through red tape as a government minister. But critics dismiss him as a loudmouth, and others fear he would be a potentially reckless leader. Political analysts say Sata is exploiting an undercurrent of resentment against Chinese involvement in Zambia and targeting poor, less educated Zambians, especially those working in mines or markets such as Kamwala. China has long been involved in Zambia. In the early 1970s, the Chinese government built a 1,155-mile-long railway linking landlocked Zambia to the port city of Dar es Salaam in neighboring Tanzania. In recent years, China has become an even more important player in Zambia’s economy as it invests throughout Africa to feed its growing resource and energy needs. Zambia is the world’s 11th-largest copper producer, and China has sunk millions of dollars into mines, helping to revive operations after a decline during the mid-1990s. China has helped restart some Zambian textile mills, and Chinese contractors have aided road construction. These projects have employed more than 10,000 Zambians, and Chinese investment in Zambia has topped $300 million, according to the Chinese Embassy. But Chinese-owned copper mines are known for low pay and hazardous practices. In 2005, 51 Zambian workers died in an explosion at the Chambishi mine. “We can appreciate investment, we can appreciate them employing people, but a lot needs to be done in terms of the conditions of service. . . . They need to do a lot in terms of the safety of the workers,” said Rayford Mbulu, president of the Mineworkers Union of Zambia. An influx of Chinese traders — bringing with them inexpensive Asian-made products — has only added to the resentment. Chinese and Lebanese retailers have moved into rebuilt shops in Kamwala, where the rent is too steep for some Zambian entrepreneurs. At the same time, many Zambians have benefited from the availability of cheaper Chinese goods — a source of frustration to shop owners who contend that Chinese products are of inferior quality. Sata blames the Chinese for mining accidents and says Chinese immigrants should not be competing with Zambian retailers. Many Zambians say that while China should be forced to play by the rules, Zambia simply cannot afford to close its doors. TOKYO (AP) — Nationalist Shinzo Abe became head of Japan’s ruling party by a landslide Wednesday, a victory expected to lead to his election as prime minister next week. Abe won 464 of the 702 votes counted, a majority of 66 percent. Foreign Minister Taro Aso came in a distant second with 136 votes and Finance Minister Sadakazu Tanigaki garnered 102 votes. By winning the three-year term as Liberal Democratic Party president, Abe, a proponent of a hard line against North Korea, and a more militarily assertive Japan, all but guarantees his election as premier in the vote in parliament on Sept. 26. ”From now on, I would like to join everyone in helping Mr. Abe win the public trust,” Prime Minister Junichiro Koizumi <http://topics.nytimes.com/top/reference/timestopics/people/k/junichiro_koizumi/index.html?inline=nyt-per&gt;, Abe’s mentor, said minutes after the vote. Abe stood up and quietly bowed in all directions when the results were read. Abe, 51, would be Japan’s youngest postwar prime minister and the first born after World War II. He is relatively inexperienced, having joined the parliament in 1993 and assumed his first Cabinet position only a year ago. The son of a foreign minister and grandson of a prime minister, Abe has campaigned on forging a more confident Japan. He is expected to seek to revise the pacifist constitution to give the military more freedom of action and bolster the security alliance with Japan’s top ally, the United States. Despite his inexperience, Abe came to the vote with key essentials for victory: high support ratings inside and outside the party and the blessing of Koizumi, who remains widely popular after five years in office. Because Abe’s victory appeared certain, the competition has been lackluster. Challengers such as Tanigaki and Aso never came close to rivaling him in popularity or a vision for Japan’s future. The lack of competition, however, has led to a lack of clarity about Abe’s policies. One looming question for Japan’s neighbors is how far Abe will push his vision of a country freed from the restraining legacy of World War II, in which Tokyo’s attempt at regional hegemony left Japan and much of Asia in ruins. Abe, for instance, supports revisionist history textbooks that teach students to take pride in their nation rather than focus on the dark accounts of Japanese atrocities and aggression. He is also a proponent of the Yasukuni war shrine, which honors war criminals among the country’s war dead. He has compounded this conservative image by questioning whether every prime minister must repeat Japan’s standard apology for its wartime actions. When North Korea tested several missiles in July, Abe suggested a look into whether the constitution would allow Japan to conduct a pre-emptive military strike. It was unclear how that approach would affect Japan’s troubled relations with China and South Korea, two victims of Japanese aggression who have refused to meet with Koizumi because of his visits to the Tokyo war shrine. If he ultimately becomes prime minister, Abe will take the helm of a Japan in transition. After five years under Koizumi, reforms have made Japan a more competitive market, powering the economy out of a decade-long slowdown but also widening an increasingly troubling gap between rich and poor. Japan already has started shedding its postwar pacifism. Koizumi pushed for — and won — the power to dispatch the military in unprecedented non-combat roles to help U.S.-led missions in Afghanistan and Iraq, despite domestic opposition. ‘Coup’ sparks Thailand emergency Thai Prime Minister Thaksin Shinawatra has declared a state of emergency in Bangkok amid reports of a coup attempt. Soldiers have entered Government House and tanks have moved into position around the building. Mr Thaksin, who is at the UN in New York, announced he had removed the chief of the army and had ordered troops not to “move illegally”. Correspondents say that there have been low-level rumours of a possible coup for weeks. Thai media say that two army factions appear to be heading for a clash, with one side backing the prime minister and the other side backing a rebel army chief. Our correspondent Jonathan Head said it was not clear which faction had taken the initiative. He said there has been pressure growing on the prime minister to resign, including groups close to King Bhumibol, following a political impasse in which April’s general election was declared invalid. But it was thought that Thailand was making progress towards holding another election later in the year, our correspondent says. Witnesses said several hundred troops were posted at key points around Bangkok, including at government installations and major intersections. At the United Nations, where the annual General Assembly is under way, it was announced that the agenda had been changed to allow Mr Thaksin to address it in the coming hours. I really enjoyed the article below. There is definitely another side to the “Chinese Miracle” as the income gap between the eastern seaboard cities and the rural countryside increase. Most Chinese live still do not live in cities, as much as 60% (according to the Chinese government, and I am guessing that is optimistic) live in rural areas. To give CCP its credit, it has lifted more people out of poverty than ever before in human history, however the growing gap between the cities and the rural areas, lack of legal worker mobility, lack of representation, and corruption are causing ethnic unrest. The CCP is very sensitive to this because they know their own history. The communist revolution was started in the city but won in the countryside. Most Chinese revolutions went this way as well. They also know that China has never had a revolution in good economic times, so they are desperately trying to suppress these uprisings and news of them as long as possible to keep discontent from spreading and becoming organized. In the meantime they are desperately trying to stop corruption (at least at the local level), build up infrastructure, and attract industry. I wonder if China can do this fast enough to counter discontent with CCP rule. I also how this plays in with the gender gap. You have all these young men in China who are poor in rural areas and have no chance of getting married, because they just are not competitive economically for the few females there are. Typically societies with such gender gaps are prone to all types of social ills, this fact can not be helping the CCP’s situation. Large-scale public disturbances have been on the rise in China for more than a decade. Media reports describe violence, injuries, and even deaths on both sides, linked to brick-throwing, tear gas, Molotov cocktails, rockets, bullets, beatings, burned vehicles, stabbings, and standoffs between hundreds of police and thousands of protestors. Claims by demonstrators and police are often at odds, but all agree that events can turn deadly and that serious injury and loss of property are common. Issues include labor grievances, taxation, land confiscation, and pollution. Corruption worsens common injustices and further inflames citizen anger. Industrial China no longer pretends to be a workers’ paradise. In southern China in 2005, 100 shoe factory workers smashed vehicles, threw rocks, and injured three police over unpaid wages. Thousands of workers at an electrical factory struck for four days over working conditions and the right to unionize. In western China, 2,000 laid-off workers barricaded a street and demanded severance pay. In 2004, more than a thousand workers in two south China factories struck for higher pay and one rest day per week. Elsewhere, workers took their bosses hostage over unpaid back wages. Two years earlier, in 2002, 80,000 retired workers in northeast China protested unpaid pensions. Until recently, taxes, fees, and tolls caused widespread unrest. In 2004, 30,000 people confronted hundreds of police and paramilitary units in a riot over bridge tolls. In 1999,10,000 peasants in central China demonstrated against taxes and fees. Police attacked with tear gas and batons. In one compilation for five provinces in 1997, half a million peasants took part in violent demonstrations in over 300 townships, with 250 injuries and fourteen deaths, including five police. 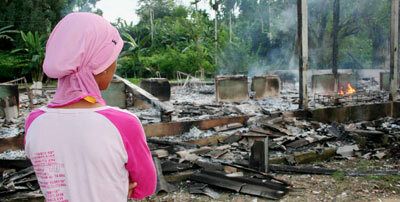 Poorly compensated farmland seizures now trigger most rural unrest. In January 2006, 20,000 farmers fought police over land condemned for a highway and an industrial zone. In December 2005, police fired on crowds opposing a new power plant, killing either three or twenty farmers, depending on one’s source. In 2005, several thousand southern farmers, trying to stop earth-moving machinery, fought 600 police armed with clubs. In northern China, developers and officials hired thugs with pikes and knives to attack protesting villagers, killing six and injuring fifty. In 2004 in western China, only martial law stopped 90,000 protesters from fighting police over the loss of their homes to a hydroelectric dam.